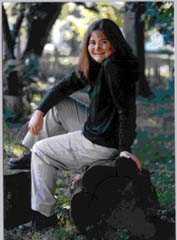 Editor's note: This is the Valedictorian Address delivered at West Boylston High School, West Boylston, Massachussetts on June 1, 2001. .
Gabrielle has encounters with flame throughout the series. Fire is a powerful, awe-inspiring substance. A flame is a source of light, a symbol of hope, and a guiding beacon. As human beings, we all strive to become like a flame, an individual to whom others look for guidance, compassion, and inner strength. In graduating high school, we take another step towards meeting this lifelong goal. It is a time to celebrate and to look to the future, whatever it may be. On the show Xena: Warrior Princess, Renee O'Connor portrays Xena's sidekick, Gabrielle. In the first episode of this show, Gabrielle is a naive villager eager to leave her hometown and see the world. Like all of us, she wishes to ignite her spirit. She abandons her peaceful life and joins up with Xena, unsure of her future but ready to embrace it. The only way for Gabrielle to reach her potential as a person is to leave her village, her family, and her friends in order to pursue her dreams. Likewise, we are moving on to lives beyond this school, town, and community. Some of us are going farther away than others, and some of us aren't going far at all, but our lives will undoubtedly be very different next year. We can look to Gabrielle for inspiration. Through her adventures with Xena over the years, she changes from an inexperienced follower into a knowledgeable, confident, and capable leader. She becomes the person she had always dreamed of being. As the series draws to a close this spring, Gabrielle continues to embody the spirit of fire. She succeeded because she found the spark within herself and kindled it into a glowing flame. We must strive to do the same, lighting our own flames that flicker with our individuality and radiate with our accomplishments. The uniqueness of each one of us is already apparent, which makes it difficult for me to represent my entire class in this short speech. We are all very original people, joined together as "The West Boylston Class of 2001." We are individuals. We have different opinions, different talents, different hopes, different dreams. Each of us has made a distinctive contribution to this class simply by being him or herself. Our class includes talented artists, musicians, actors, athletes, and scholars, as well as leaders, activists, and public speakers. We also have people who excel at encouraging their classmates, making them laugh, putting them at ease, defending them, or otherwise helping them out when they need it. In anticipation of speaking in front of you all, I have recently been a recipient of such aid, and I have to say, it means a lot. The talent in this class is amazing, and it has made us into a very strong, resourceful, unified group of people. We have been through a lot together, and this evening we have assembled one final time, united in our success. Tonight is the climax. We are closer to each other now than we ever were before or ever will be again. From now on, we will all go our separate ways. It will take time and a lot of work, but we are ready to pursue our own lives. With the knowledge, skills, and experience we have gained in high school, we are ready now to follow our dreams and become bright flames. Though we are gathered in a happy ceremony, a sadness also pervades the atmosphere. We are excited to take the next step in our lives, but we are reluctant to have to leave so much behind in order to make new gains. While the memories of high school will remain with us throughout our lives and our connections to this town and school will not completely break, everything will change. I'm grateful for my experiences here, and for everyonemy mom, dad, sisters, and friendswho has guided me so far, and I think I speak for everyone in my class when I say thank you to our families, friends, teachers, fellow classmates, and any other people who have helped us along the way. Though we will become more independent as time passes, we will always remember the guidance you provided us and continue to look to you for direction. My classmates and I wish all of you the very best of luck. Go, succeed. If you get discouraged, don't give up. If you make a mistake, learn from it. If you are challenged, stand up and fight. And in the end, burst into the bright flames that I know each one of you is able to become. After graduating high school, B'Tal went to college and spent some time abroad. As of 2009, she's pursuing a PhD in Classics. She still likes Xena, but it is not the obsession it once was.